Wall art is a wonderful way to complement your room’s style or add that conversation piece you’ve been looking for. J&M is proud to introduce the Wall Art Collection which is exclusively printed through a state of the art process onto an acrylic canvas. From depictions of some of the most breathtaking places to stunning still photographs, there are plenty of inspirational pieces in a variety of different styles, sizes, and color palettes to choose from. 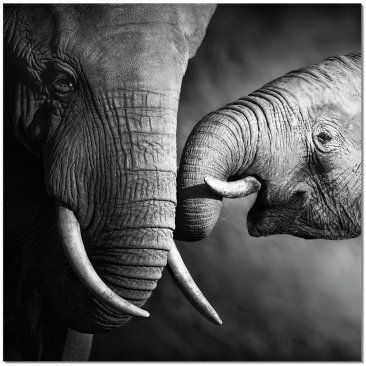 This acrylic wall art illustrates the love and the affection between the mother elephant and her calf. This represents good fortune and protection.